In large bowl, mix 2 tablespoons of the oil, the cumin, coriander and salt. Add bell pepper and onion; toss to coat. Pour vegetable mixture in pan. Roast 15 minutes. Stir vegetables on pan. Meanwhile, in same bowl, mix chicken, remaining 2 tablespoons oil and the taco seasoning mix; toss to coat. Add chicken to pan with vegetables. Roast 10 to 15 minutes longer or until chicken is no longer pink in centre and vegetables are tender. Heat bowls as directed on package. Divide beans among bowls. Divide chicken and vegetables among boats. Top with cheese and cilantro. Serve with lime wedges. This super fast meal lets you cook and prep all at once. Heat the oven while you prep the veggies. Roast the veggies while you prep the chicken. Then roast the chicken while you prep the taco fillings and toppings. 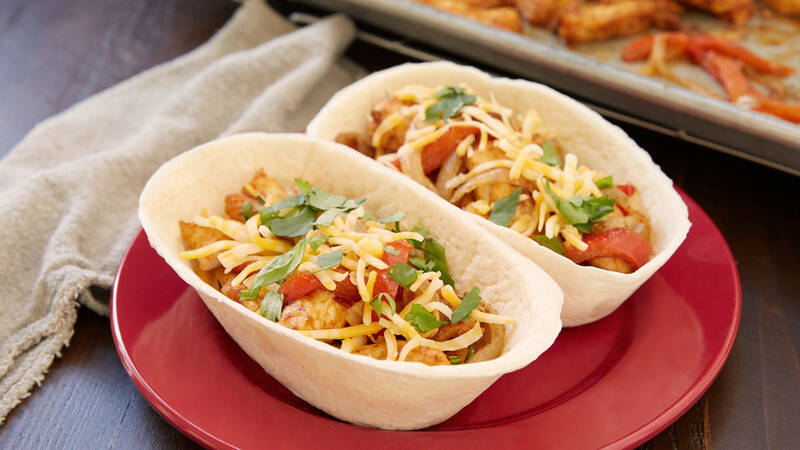 For even more fajita flair, serve with Mexican rice, guacamole and Old El Paso™ Thick N’ Chunky™ Salsa.